Point Pleasant freshman Emma Harbour (18) waits for a relay throw at third base as River Valley senior Baylee Hollanbaugh (9) starts a slide attempt during the first inning of Thursday night’s softball contest in Point Pleasant, W.Va. Hollanbaugh was tagged out on the play. POINT PLEASANT, W.Va. — One big inning made all the difference. 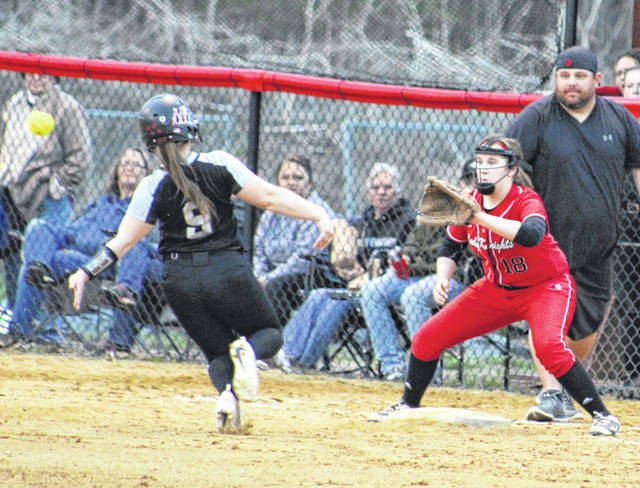 The Point Pleasant softball team plated three runs in the bottom of the fifth and ultimately cruised to their third consecutive victory on Thursday night with a 4-1 decision over visiting River Valley in a non-conference matchup in Mason County. The host Lady Knights (4-1) and Lady Raiders (0-4) were locked in a defensive struggle through three scoreless innings, but the Red and Black finally broke through in the fourth as Rylee Cochran doubled home Tayah Fetty for a 1-0 edge. The Silver and Black — who had stranded six baserunners through four frames — left the tying run at second at the end of their half of the fifth … and Point rode that momentum into the home half of the frame. Emma Sayre led things off with a bunt single and advanced to third on a double from Peyton Jordan, then Hayley Keefer received a walk to load the bases. With one away, Emma Harbour singled to left while bringing both Sayre and Jordan home — but Keefer was tagged out at third while trying to move up a base. With two outs and Harbour at first, Cochran delivered a triple to left-center that allowed Harbour to score for a 4-0 advantage after five full frames. The Lady Raiders finally broke into the scoring column in the top of the sixth as Kasey Birchfield singled and stole second, then moved to third base on a groundout. With two away in the inning, Kaylee Tucker beat out an infield single that allowed Birchfield to score — cutting the deficit down to three runs. The guests also went down in order in the top of the seventh. Point Pleasant outhit RVHS by an 11-7 overall margin and also played an error-free contest, while the Silver and Black had only one error in the game. River Valley stranded nine runners on base, while the hosts left seven stuck on the bags. Kit Stroud was the winning pitcher of record after allowing four hits and two walks over four innings while striking out two. Baylee Hollanbaugh took the loss after surrendering four earned runs, nine hits and two walks over 4⅔ innings while fanning three. Jordan and Harbour both paced Point Pleasant with three hits apiece, followed by Cochran with two safeties. Sayre, Tayah Fetty and Annabelle Shrader also had a hit each for the victors. Harbour and Cochran accounted for two RBIs apiece. Jordan, Harbour, Fetty and Sayre each scored once. Brooklyn Sizemore led River Valley with three hits, while Birchfield added two safeties. Tucker also had a hit and an RBI, with Birchfield accounting for the team’s lone run scored. Point Pleasant returns to action Monday when it hosts Winfield at 5:30 p.m.
River Valley traveled to Fairland for a doubleheader Saturday and returns to action Monday when it hosts Meigs at 5 p.m.